Deliver a load of goods up to High Hrothgar for Klimmek. 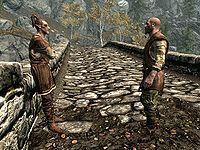 Speak with Klimmek about his trips to High Hrothgar. Receive Klimmek's Supplies, and climb the steps to High Hrothgar. Place supplies in indicated chest. Return to Klimmek for your reward. "I'm just not ready to make the climb to High Hrothgar." Gwilin: "On your way up the 7,000 Steps again, Klimmek?" Klimmek: "Not today. I'm just not ready to make the climb to High Hrothgar. The path isn't safe." Gwilin: "Aren't the Greybeards expecting some supplies?" Klimmek: "Honestly, I'm not certain. I've yet to be allowed into the monastery. Perhaps one day." Apparently Klimmek makes a trip every few weeks up the 7,000 steps to High Hrothgar to deliver supplies to the Greybeards, though he has never actually seen them in person. Alas, he is now an old and feeble man and he just doesn't have the strength to make the trip. You can choose to help him, with the promise of a reward. 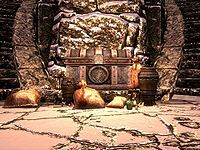 He will give you a bag of supplies and ask you to place them in a chest outside the High Hrothgar monastery. If you have already discovered High Hrothgar, you may simply travel there. If not, you must climb the 7,000 steps leading out of Ivarstead and up the mountainside, encountering some wolves along the way. Once at the top of the 7,000 steps, you will see the monastery with a chest located in the center of a pair of stairwells that lead up to the building itself. Now just open the chest and place the supplies inside. Klimmek's supplies are found in the Misc section of the inventory. Once you have placed the supplies in the chest, return to Klimmek, who will compensate you for your leg work. He will give you a level-dependent amount of gold as a reward. Klimmek's supplies will remain in the chest indefinitely. They can be taken at anytime and returned at anytime, however doing so will not grant you any further reward. Klimmek's supplies are always persistent; placing them in a corpse keeps it from despawning. If you drop Klimmek's supplies after completing the quest, they will hover in the air and can be used as a platform of sorts. On the PC, it is possible to use the console to advance through the quest by entering setstage FreeformIvarstead04 stage, where stage is the number of the stage you wish to complete. It is not possible to un-complete (i.e. go back) quest stages, but it is possible to clear all stages of the quest using resetquest FreeformIvarstead04. This page was last modified on 15 December 2014, at 15:57.